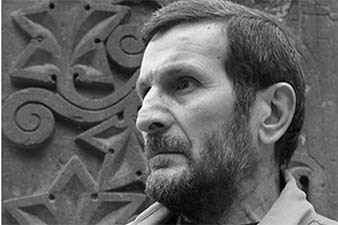 Prose writer, publicist Levon Khechoyan died in Yerevan today. The Armenian government earlier allocated 20,000 euros for L. Khechoyan’s treatment abroad. He received post-surgery treatment in Germany and was transported to Armenia. Levon Khechoyan was born in 1955 in Baralet village of Akhalkalaki region in Georgia. In 2000 he received the Gold Reed literary award of the Armenian government for his book ‘Black Book, Heavy Bug’. L. Khechoyan was a participant of the Artsakh war. He resided in the city of Hrazdan, Kotayk province. According to NSS, enough proofs have been gathered testifying Sanasaryan’s relation to the crime. The interlocutors discussed ways of strengthening Armenia-Diaspora relations and various issues of national importance. “It is unclear on what events the sum will be spent on. It would have been better for the authorities to first present the program of events. I do not know what they intend to do, but when we raise any issue they say the budget means are small. Spending 124 million AMD on the Day of Citizen in such conditions is unnecessary luxury,” the lawmaker said. The PBX has a flexible infrastructure, which lets customize its settings in a way as to meet the company’s needs as close to its activities and objects as possible.